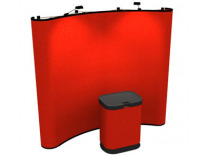 Economy Full Height pop up trade show displays: Economy Pop Up Displays can be a great starting point in your trade show experience; before you get to the point where you're doing this 6 times or more per year. Remember, not every trade show event demands that you have the best trade show displays, and this is the niche market for the economy models which are for those few occasions per year where you might take the booth yourself and set it up and are in complete control of what happens. Call us, and we'll be happy to visit with you about it. See How Far Your Money Will Go! With the proliferation of Chineese pop up displays that flood the market, how do you know which ones will perform to the standards that you need? First make a decision about how many times the display needs to be used given the price you'll be paying for it. Does it sound reasonable? Next, ask yourself if for the price somebody is asking you to pay for the display, if something does go wrong, and there needs to be a repair, is the profitability great enough for that distributor to be able to afford to service the product? Quality pop ups normally have been in the market for a period of time and the manufacturer probably has developed a number of useful accessories to support the product. 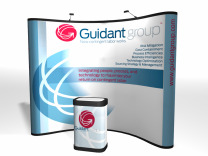 Does the product you're considering, have any trade show accessories developed by the manufacturer that compliment it? As a long time retailer of products related to trade show displays, ShopForExhibits has extended their product lines to include new product offerings in the premium pop up displays line, along with new products in the retractable banner stands line. To keep up with the business activity they project in the future, ShopForExhibits.com has just gone live with an entirely new web site which provides prospective customers with an elevated level of product information along with product videos and graphic templates. As a result of the recent economic climate, that is anything but predictable, online retailers have to be flexible in what they offer exhibitors as well has being aware of the declining price point that companies are willing to pay for trade show related products. Being successful in bringing new products to market such as the new tension fabric displays, isn't as easy as one would think, but due to the years of experience with display products and internet marketing, ShopForExhibits.com has positioned themselves to lead the pack and be a successful competitor in this industry. Classic Exhibits has developed several new outstanding products in the past few years that take advantage of lighter weight materials such as extruded aluminum and fabric, to bring new high demand products to the trade show exhibit industry. What moves did they make to achieve success in a time where little new innovation was being introduced in the trade show industry? Classic noticed that they had several shapes of aluminum extrusions that they were purchasing that gave them an exceptionally large amount of linear feet of metal per dollar when compared to other shapes. Their ingenuity and resourcefulness have spawned several entire series of custom modular hybrid displays and provided the market something new to look at. Leading the list of new custom modular hybrid displays is the Perfect 10 followed by the Magellan Miracle and Sacagawea tension fabric displays. For the resellers of Classic Exhibits products, the future looks bright because of the creativity and ingenuity on Classic’s part, and some great promotion through an online program Classic created called exhibit design search, which is an internet search program for trade show exhibits which we utilize extensively on the ShopForExhibits.com web site.